It had been a very long time since my last visit to the NC Zoo. In fact, my daughter was still in a stroller on my last trip and she will be 13 this year! We decided to make it a day trip this year and I’m so glad we did. It is by far one of my favorite day trips we’ve done recently. My daughter gave the same enthusiast response. Why did we feel that way? Well I’m happy to share all about our trip here, as well as some tips for you and your family if you plan to make it a day trip as well! First off, do your homework. My daughter homeschools so I also did this as a field trip. Therefore, I had her look at the full list of animals at the zoo and told her to pick three she absolutely did not want to miss. Even if your trip will strictly be for fun, this is a great thing to do. It allows the child to feel like they have some say over the trip and understand there is no expectation that they will see every single animal, but will try to ensure they see these animals for sure. Speaking of not seeing every animal, it’s a huge zoo. In fact, it’s the world’s largest natural habitat zoo! Therefore, unless you plan to spend several hours there, it’s possible you might not see everything. After all, there are over 1,800 animals at the zoo. I highly recommend making it a whole day trip though as there are so many cool animals and exhibits. Plan to spend at least 2 hours in each ‘continent’ – Africa and North America. Then, don’t forget to factor in time for lunch! We got to the zoo at 10:30 a.m. and left around 3 p.m. This allowed us enough time to experience the entire zoo. The one experience we missed was not seeing a feeding time. If that is on your to do list, be sure to visit this feeding times list and plan the time into your trip! One thing to consider as it’s an outdoor day trip location, is the weather. Don’t forget to pack the umbrellas and rain coats. Sunglasses are also a must on sunny days! Wearing comfortable shoes is also a must. If you walk the entire zoo it’s a five mile trek! Lastly, in your planning stage don’t forget about food. If you want to save money, then pack lunches. There are picnic tables by both continent parking lots that you can go back out to use for lunch. However, if you don’t mind spending the extra money, there are some delicious food options at the zoo. We choose to eat at Wild Burger. The Carolina Chili Fries were amazing! I was pleased they had many gluten-free options throughout the zoo. Park visitors can also bring a bottled, non-alcoholic beverage and small snack into the zoo. While I’m all for planning, be sure to remember sometimes you have to plan to have no expectations. One reason, outside of the fun we had seeing everything, that this was one of our favorite day trips was we went into it with no real expectations other than just enjoying ourselves and seeing some cool animals! As moms we often set slightly unrealistic expectations on how trips should go, and let’s face it traveling anywhere with kids never seems to go quite the way we think! Get lots of pictures – not just of the animals but of you and your kids enjoying the trip. The ‘extras’ really do make the difference, or did for us. For instance, I’m so glad we had ‘Fun Tickets’ to feed the giraffes. That was one of our favorite parts! They can also be used for other attractions. My daughter, even as a tween, still loved using them to ride the carousel. We also gave the Air Hike Ropes Course a shot, and that was when I realized I was not wearing the best shoes for the trip! It was a lot of fun, but next time I’ll be certain to wear tennis shoes with some grip on them. Kids must be a certain height to do the rope course. If they are over 48” tall but under 60” they can go but must be accompanied by someone who is over 60”. Which is how I ended up on the course with my daughter, but it was worth it! This summer they are also opening a mini-rope course for younger kids too. As a homeschooling parent I loved that there were so many interactive and fun learning tools at most exhibits. Sarah was able to learn so many fun facts about each of the animals we saw. She also watches a lot of documentaries on animals, and really surprised me with a lot of the facts she already knew. Another thing she enjoyed and was a great learning experience, was being in charge of the map. Letting the kids help point the way really lets them feel like they are helping mom. You can even download the map in advance by clicking here. 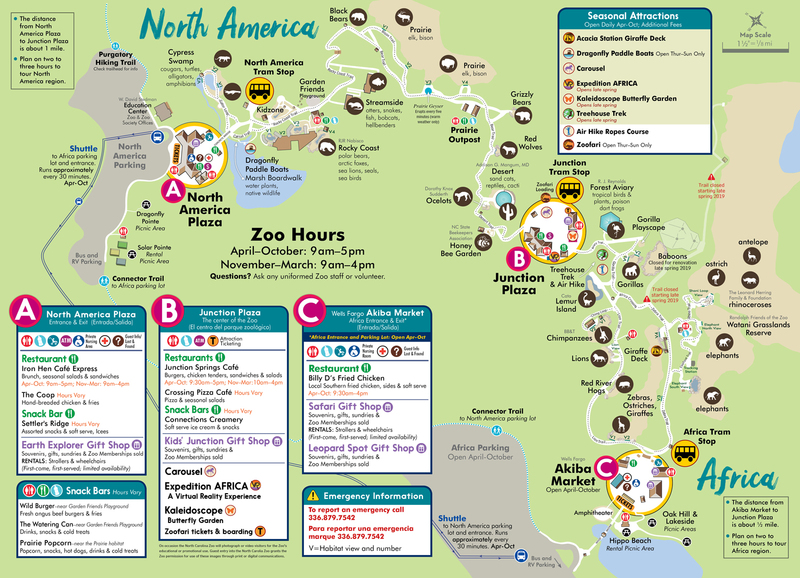 One more planning tip related to the map, I highly recommend starting in one continent and working your way through the entire park to the other continent, then riding the tram or shuttle back to your origin parking lot. There are tram stops within the park at the beginning of each continent and in the middle, a.k.a. Junction Plaza that regularly run. There is also the shuttle that goes between each parking lot about every 30 minutes during April and October. If you and the family are big fans of walking, there is also a connector trail that connects the Africa and North America parking lots. Every child in the state of North Carolina gets a free trip to the NC Zoo, which for public school kids is in the form of a field trip. To my fellow homeschool parents, don’t feel excluded because they each get a free trip too. You must pre-register online though here. It even includes one complimentary adult admission per reservation. My daughter and I were excited to hear that not only will the NC Zoo celebrate its 50th anniversary in 2024, but they will be opening a new ‘continent’ – Asia. This will include new animals such as, red pandas, komodo dragons, tigers, and cranes. The red panda is my daughter’s favorite animal, so needless to say she was beyond ecstatic to hear this! You can probably tell from this blog and our photos, we are already planning our next day trip to the NC Zoo! Start planning your visit by visiting nczoo.org or just head over to 4401 Zoo Parkway, Asheboro, NC 27205 to see all this fun for yourself! See more Day Trip ideas here!